Comfrey (Symphytum officinale L.) is a perennial herb of the family Boraginaceae that grows in moist and damp areas and is native to Europe and temperate parts of Asia. Comfrey grows to about 5 feet in height, has thick hairy stem, black, turnip-like root with whitish juicy flesh. Comfrey has large, hairy broad leaves; shapes may differ according to the position of the stem. 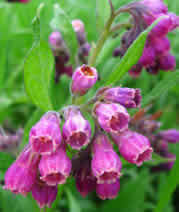 Comfrey bears small bell-shaped flowers of various colors, typically cream, blue or purplish arranged in clusters. The more common is the Russian comfrey which is a hybrid between S. offinale and S. asperum, termed Symphytum × uplandicum. The Russian comfrey is widely found in the British Isles, Ireland and other European countries. Comfrey has been in use for centuries, where references of its use dated back to early sixteenth century. Comfrey is traditionally used to treat wounds and bone fractures. Comfrey contains pyrrolizidine alkaloids that makes it toxic and can harm the liver. Internal use has been prohibited in USA, Germany, United Kingdom and other European countries. Comfrey preparations are made from the leaves or other parts of the plant grown above the ground. New leaves tend to have more of the poisonous pyrrolizidine alkaloids than older leaves. Some preparations were also made from the roots, but roots contain up to 16 times the amount of pyrrolizidine alkaloids. Comfrey has been used to treat intestinal disorders, including diarrhea, dysentery even intestinal ulcers. Comfrey is used to treat pulmonary ailments, bleeding hemorrhage and bleeding of gums. 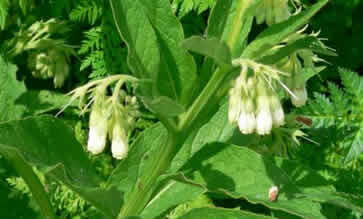 Comfrey is used to treat variety of skin problems that included cuts, wounds, boils, pimples, burns, sores and ulcers. Comfrey is well known to aid the healing of sprains and bone fractures by minimizing the inflammation and promoting cell regeneration. Comfrey is also used as an anti-fungal and anti-bacterial treatment. 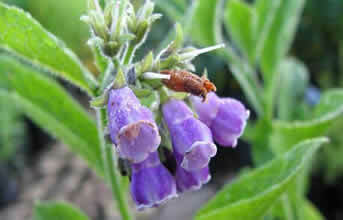 the British Journal of Sports Medicine conducted a study on comfrey activity against back pain. Results have shown that there is a considerable difference between comfrey extract and placebo group. Comfrey extract caused a 95.2 percent decrease in perceived pain during standard movements and it produced the pain-relieving effects rapidly. Comfrey’s therapeutic activity is attributed to its content of allantoin, a cell proliferant, and rosmarinic acid, that speed up the replacement of body cells. Allantonin is also an anti-inflammatory agent that prevents microvascular injury. Allantonin are well absorbed by the skin penetrating deeply into the body. Bleakley CM, McDonough SM, MacAuley DC. Some conservative strategies are effective when added to controlled mobilisation with external support after acute ankle sprain: a systematic review. Aust J Physiother. 2008;54(1):7-20. D'Anchise R, Bulitta M, Giannetti B. Comfrey extract ointment in comparison to diclofenac gel in the treatment of acute unilateral ankle sprains. Arzneimittelforschung. 2007;57(11):712-6. Grube B, Grunwald J, Krug L, Staiger C. Efficacy of comfrey root (Symphyti offic. radix) extract ointment in the treatment of patients with painful osteoarthritis of the knee: results of a double-blind randomized, bicenter, placebo-controlled trial. Phytomedicine. 2007;14(1):2-10. Koll R, Klingenburg S. Therapeutic characteristance and tolerance of topical comfrey preparations. Results of an observational study of patients. Fortschr Med Orig. 2002;120(1):1-9. Ridker PM, Ohkuma S, McDermott WV, Trey C, Huxtable RJ. Hepatic venocclusive disease associated with the consumption of pyrrolizidine-containing dietary supplements. Gastroenterology. 1985;(88):1050-1054. Weston CFM, Cooper BT, Davies JD, et al. Veno-occlusive disease of the liver secondary to ingestion of comfrey. Br Med J. 1987;295:183. Yeong ML, Swinburn B, Kennedy M, Nicholson G. Hepatic veno-occlusive disease associated with comfrey ingestion. J Gastroenterol Hepatol. 1990;5(2):211-214. Comfrey poultice may be prepared using fresh or dried leaves and roots of common comfrey and applied directly to affected area. Comfrey products designed for oral intake are banned in the U.S. Germany, UK and other European countries. Comfrey contains pyrrolizidine alkaloids a toxic substance that can damage the liver and even cause death. Take internally only upon direct supervision of a health practitioner. Comfrey constituents are well absorbed into the skin. Do not use for more than 10 days. Not recommended for people with liver problem.